This is the pitya, dragon fruit – indigenous to Central America but is also grown and exported from several Southeast Asian countries, such as Thailand and Vietnam. Obtained from several cactus species, its succulent stem provides the uniquely delicious fruit with moisture in the arid climates where it grows. 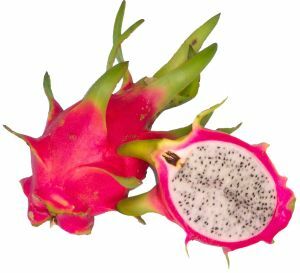 Dragon fruit is also knows as Dragon Fruit, Red Pitahaya, Night blooming Cereus, Strawberry Pear, Belle of the Night, conderella plant. To choose a ripe dragon fruit: look for bright, even-colored skin. If the fruit has a lot of blotches, it may be over-ripe (a few is normal). Hold the dragon fruit in your palm and try pressing the skin with your thumb or fingers - it should give a little, but shouldn't be too soft or mushy. If it's very firm, it will need to ripen for a few days. To preserve most of its flavor and nutrients, the dragon fruit is usually eaten raw as a healthy snack, salad , Sundae, or it is pureed into juice, smoothies (also see ), cup cake (also see), cheese cake, Yogurt Mousse Cake, layer cake, sorbet , pancakes, breakfast dishes, sherbet , jelly (also see ), popsicles (also see here and here ), panna-cotta, salad (also see ), martini , Pitaya Plus Radiance Parfait, pie . pitya is low in calories and offers numerous nutrients, including Vitamin C, phosphorus, calcium, plus fiber and antioxidants. 1. Dragon fruit boosts immune system. Dragon fruit is rich in vitamin C and fibers that help provide an overall healthy body. 2. Dragon fruit helps in digestion. Because of the richness in fibers, Dragon fruit aids in the digestion of food, Studies also suggest that Dragon fruit promotes the growth of probiotics. 3. Dragon fruit help to lower blood glucose levels in type 2 diabetes. Studies also suggest that the the glucose found in Dragon fruit aids in controlling the blood sugar level for diabetes patients. 4. Dragon fruit prevent formation of cancer causing free radicals. Dragon fruit is rich in minerals and fibers that aids in digestion, cleans toxic ingredients thus preventing the occurrence of colon cancer. 5. Dragon fruit as anti-oxidant. The presence of high level of vitamin C, minerals and pytoalbumin is regarded as relevant in fighting free radicals and possess anti-oxidant properties. 6. Dragon fruit helps to control cholesterol level. Dragon fruit is also rich in flavonoids that are known to have favorable effects against cardio related disease. 7. Dragon fruit promotes healing of wounds and cuts. 8. Dragon fruit improves appetite. 11. Dragon fruit improves memory. Recipe using Pitaya see Here and Here, Here.